MICHAEL VAN GERWEN'S amazing year continued with his 23rd tournament victory as he retained the Ladbrokes World Series of Darts Finals on Sunday night, edging out Peter Wright for a second successive year at Glasgow's Braehead Arena. 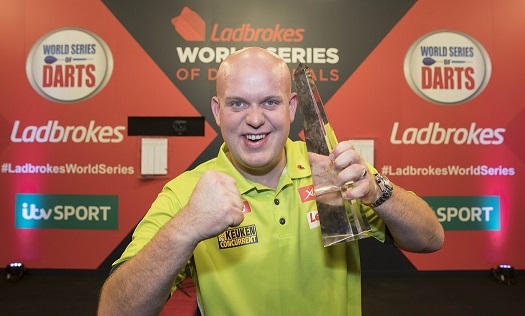 Dutch star van Gerwen had defeated Wright 11-10 in the inaugural World Series of Darts Finals a year ago, and after the pair again won through to the decider on Sunday it was the world number one who scooped the 30,000 pound first prize with an 11-9 victory. The achievement saw van Gerwen claim a third successive televised title - following his wins in the World Grand Prix and European Championship in October - and backs up his World Series triumphs in Shanghai and Perth earlier in 2016. Wright followed up Saturday's second round win over Daryl Gurney with a 10-7 quarter-final defeat of Joe Cullen, before seeing off Phil Taylor in the semi-finals for a second successive year. Taylor hit back from 5-2, 6-4 and 8-6 down in a game of exceptional quality to win four straight legs and move to the brink of victory at 10-8, but crucially failed to close out the win as Wright - who landed 13 180s in the game - capitalised for a deciding-leg triumph. Van Gerwen enjoyed a more comfortable run to the final as he brushed aside Saturday's narrow 6-5 win over Gerwyn Price with an unplayable 10-0 whitewash of Simon Whitlock in the quarter-finals before sweeping past Dave Chisnall 11-3 in the last four. The final proved another close affair, with the lead changing hands three times as Wright claimed an early 4-3 advantage only to see van Gerwen win five of the next six legs to turn the contest on its head and move 8-5 up. 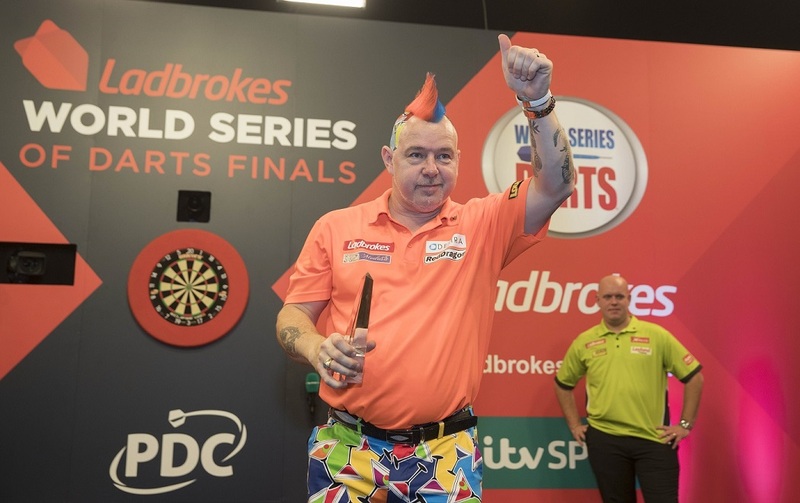 He also took two of the next three to edge to the brink of victory before Wright took three successive legs as he rallied to keep his hopes alive as van Gerwen stumbled at the winning line. The Dutchman, though, posted his ninth 180 before finally sealing the win on double two. "This is another great win for me," said van Gerwen. "I had to work really hard - Peter played really well but I'm really glad I won the game. I compete in tournaments to win and if you do win then you get great confidence, and I'm feeling good. I played okay this weekend and it's a good tournament in preparation for next week at the Grand Slam of Darts. Things are going well for me, I'm winning most of the tournaments and I'm a happy man." Wright, who picked up 15,000 pound as runner-up, was left to rue defeat in a seventh televised final as he again lost out to van Gerwen. "When you come home to Scotland, I try and play well for the fans and I think I do," said the world number five. 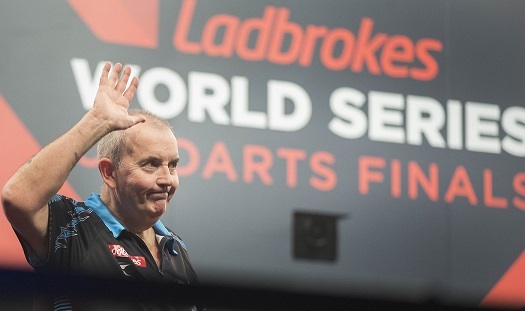 "The crowd got me through in the semi-final to play against a great champion in Michael van Gerwen. I've found the right dart now and I'm sticking with it, and I'll get back on the practice board. Many people out there believe that when I win my first TV title I'm going to win lots after that, and I believe that too." Chisnall had won through to the semis with a fine 10-6 win over Adrian Lewis in the quarter-finals to open Sunday afternoon's play, coming from 6-3 down to claim seven straight legs as he powered to victory.